Shower, do the dishes, and wash the laundry all while producing fewer greenhouse gases and spending less on electricity, thanks to the super high efficiency of the Rheem Hybrid Electric Water Heater. Upgrading pays for itself in less than 3 years2 thanks to an amazing 3.55 uniform energy factor and features that deliver long-term savings. Operates at a sound level just above a whisper—in other words, you won’t even notice it’s on. Shower, do the dishes and wash the laundry—all while producing fewer greenhouse gases. Use our free water heater savings calculator to see just how much YOU can save by upgrading to a heat pump water heater. 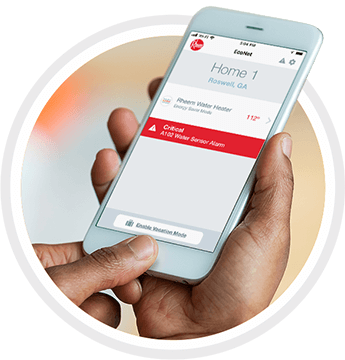 You can monitor and control the unit from your mobile phone via EcoNet™ technology and its free mobile app. Keep track of things like water temperature and energy savings, and monitor your system while you’re away. A heat pump water heater is perfect for Florida weather because the warm climate allows the heat pump to operate in every season. Also, here’s a welcome side benefit: the heat pump cools and dehumidifies the space around it, making it perfect for installation in your attic or garage. This cooling effect occurs because heat pump works by taking warm air from the environment, and expelling cool air. This cool air is especially beneficial if you do your laundry in the garage, or if you have keepsakes stored in the attic. Ready to get a hybrid electric heat pump water heater for your home? Call us now: 941-629-2500. Get the Rheem Hybrid Electric Water Heater today and enjoy years of quiet, energy-saving and worry-free hot water. Smart features like Energy Saver, High Demand and Vacation modes allow our Hybrid to provide more hot water when needed, while using less energy overall. NOTE: This information is based on a comparison of a 50-gallon Rheem Hybrid Electric Water Heater and a standard electric tank water heater, defined as an electric residential tank water heater with a 0.93 UEF, and on DOE national average energy costs. 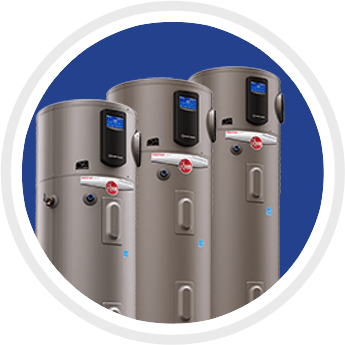 Get all the details on what makes the Rheem® Prestige® Series Hybrid Electric Water Heater right for your home. Ray’s Complete Plumbing is your local Rheem independent contractor. Print this coupon to receive $50 Off Same Day Water Heater Replacement. 1 Based on comparison against the estimated annual operating cost of a standard electric water heater of like capacity manufactured prior to 2015 under NAECA II which is likely being replaced. 2 Based on purchase price and energy cost savings of a 50-gallon Hybrid Electric Water Heater with 3.55 UEF (3.50 EF) over a 50-gallon standard residential electric water heater with a 0.93 UEF (0.95 EF). 3 WiFi Kit, WiFi broadband Internet connection and EcoNet App required; Notifications are dependent on external factors beyond Rheem’s control. 4 According to The Insurance Institute for Business & Home Safety.